I am not in control. The clock, the calendar- they are not mine. I don't get to choose when things happen. WC has never followed any sort of traditional schedule. The only thing that's been certain with her is that things will be flat unpredictable. Over the past few years, I have gotten used to playing Musical Beds, never waking up in the bed I feel asleep in. WC's SPD causes her to seek out input while she sleeps, and Little Feet Pushing Into Someone's Back (her) plus Light Sleeper Syndrome (me) do not mesh well. So when WC would make her appearance in our bed in the middle of the night, I'd quietly move to the solace of her bed, letting her jab her little feet into Mr. Sasha, who could blissfully sleep through a tornado. In her bed, all by myself, I could nestle in under her weighted blanket and get back to sleep for a few hours. But the dog often heard People Moving Around and would decide she needed to go out. And for some reason, in the middle of the night she forgets how to use her doggie door and is certain that she needs me to actually open the door for her. So there's more getting up, and walking around, and sometimes the getting back to sleep part of my plan would take a bit. And please don't think we hadn't tried to get her to stay in her bed. On the contrary! There were nights we carried her back to her bed seventy-eleven times, only to have her re-appear minutes later. Or insist that you need to stay with her. So she could push her feet into your back, obv. It was a battle that we weren't going to win, and we made peace with it. But one night last month, I awoke to my alarm to realize I was in my own bed! And so we had a little party that morning, celebrating and high-five-ing each other, and hugging WC and telling her what a wonderful, big-girl thing she did- sleeping in her own bed all night! But was it a fluke? Or was she finally ready? 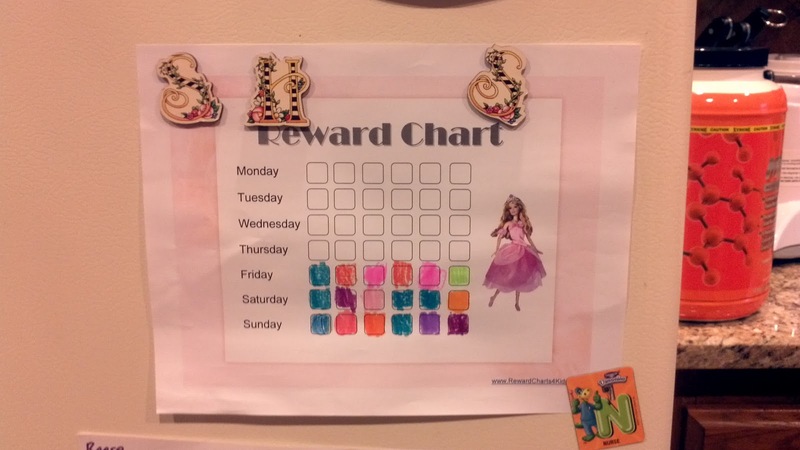 That very day I printed out a reward chart and put it on the fridge. I asked her to select a beautiful marker and color in her very first box, and promised that once 10 boxes were colored in, there would be a PRIZE. Now, you may note she started in the lower left hand corner, which was not what I planned, but fine. We just went with it. And she continued to the right, and once that row was full, she moved to the next row. Oh, there were mornings that box-coloring-in did not happen, but there were more morning that it did. I think those first 10 took about 2 1/2 weeks. But it was progress. And so now she's gotten her first reward, a variety of craft supplies, and we are working on her second. And I am getting more sleep. And my mantra from the fast few years, This Too Shall Pass, rings oh-so-true. Maybe not on my schedule, but that's OK.
My kid is the exact same way! I have been saying to my husband for ages how Ian loves to put his feet in my back!!! Glad you found a solution that works (for now!) ha ha. What a huge relief. Forget walking and talking.... These are the "milestones" we truly treasure! Oh, the Place You'll Go!